Russia’s largest carrier, Aeroflot has taken delivery of its first aircraft in 2017. It is the most spacious of the Airbus A320 family, an A321 equipped with sharklet winglets. It has recently been ferried to Moscow from Kaunas, Lithuania, the airline reported. The aircraft is fitted with the total of 186 seats in a double-class configuration, 16 in business and 170 in economy class. 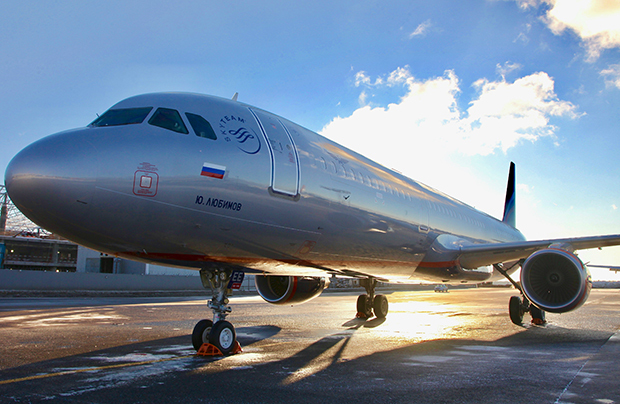 It became Aeroflot’s second A321 with such capacity. The previous such aircraft landed in Aeroflot’s fleet last October, it had previously been operated by Transaero. The airline also operates A321s with 170 and 183 seats, deliveries of the latter commenced in August 2016. The new aircraft was named after Soviet and Russian theater director, actor and teacher Yuri Lyubimov. No data on the tail number has been provided. Russia’s flagship carrier operates more than 30 A321s. Its fleet also includes 70 A320s, 20 Boeing 737s, 15 Boeing 777s, 22 A330s and 30 Sukhoi Superjet 100s (SSJ 100).